Heather and Steve would like to welcome you to Pitcairn House where we hope you will enjoy the warm, friendly atmosphere of our home. Quietly situated within a few minutes walk of Keswick town centre we are ideally placed for the Theatre, the beautiful shores of Derwentwater plus many more of the local attractions. Surrounded by breathtaking mountain scenery and stunning fells many of the famous "Wainwrights" such as Cat Bells, Skiddaw and Walla Crag are easily accessible direct from our front door. The more challenging peaks like Blencathra, Helvellyn and Scafell are also only a short distance away. With so many ourdoor facilites nearby it is easy to see why Keswick is becoming the “Adventure Capital” of the UK. 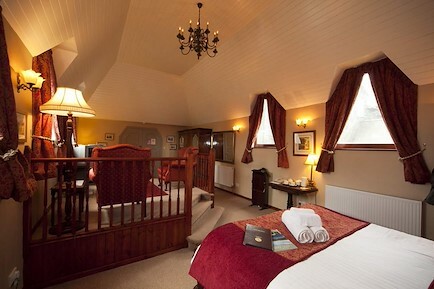 All our rooms are individually decorated and pleasantly furnished to a high standard. Choose from en-suite doubles, twin, triple and family room or for that extra specila occasion we have our feature double with King Size bed. We also have a 3 Standard Doubles which share shower and separate toilet but although not en-suite these cosy, rooftop rooms have the best views of the fells. For breakfast we offer the full cooked Cumbrian or your choice from the menu with our ingredients sourced locally wherever possible.. Vegetarian options are available and we are happy to cater for guests with special ditary requirements but please give us ample notice. Packed lunches are available on request and we will freely fill flasks. We have a drying room for those unavoidable wet days, free BT Superfast Wi Fi, cycle storage area and secure anchor points for motorcycles. We also have some off street parking at the rear of the house and plenty of FREE on street paking around the house . From north or south on M6 take Junction 40 onto A66 west and travel approx 16 (towards Cockermouth & Workington). Take slip road on left into Keswick keeping left at first junction. At next T junction turn right then pass BP Garage, Fire and Ambulance station then take next left by Millfield retirement home (sign high up on wall). Continue along Blencathra street to the other end and we are on the right (No 7) with car park at the rear. Nearest Train Station is at Penrith and Keswick Bus Station is right outside Booths supermarket. Your enquiry will be sent directly to Pitcairn House. Please fill in as much detail as you can.